Paul Longbottom sent the following photo, does it mean anything to anyone? All that is known is that Alec Riddiough is on the front row. Monday, January 8, 2018 18:25 I think this is Cross Hills Youth Club taken outside Glusburn Institute. Back row second left looks like Peter Barsby, fourth Roy Hudson, seventh Gordon Wareing. 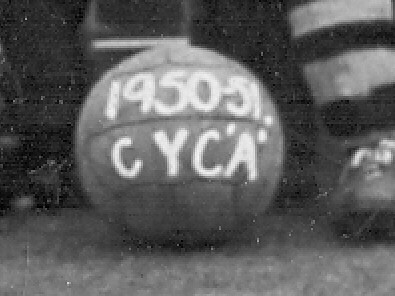 From "GLUSBURN THE OLD COMMUNITY"
In 1948 a group of young men wished to form a football club, and with the help of Mr Winch, Headmaster of Glusburn School, and Dr Renwick, this was done, calling themselves Cross Hills Youth Club, as it was Mr Winch's wish that the team should be part of the Youth Club which he had founded. The team entered the 2nd Division of the Craven League in 1949, playing on a field near Sunny Bank Road which became known as Hill 60 owing to the steep incline, often resulting in some bizarre results, eg. against Grassington, half time Grassington 6 (playing with the slope), Cross Hills nil. Final score Cross Hills 8 (playing with the slope), Grassington 6.
on the same pitch. Two years later we moved once again, this time to what is now part of South Craven School playing fields, the move necessitated by the fact that a farmer was grazing sheep on the football area in Parks Field, and it was not very pleasant to play on a pitch covered with sheep droppings. Cross Hills FC is celebrating its 60th anniversary this season and former long-time chairman Barrie Pearce, who has just stepped down from the role, reminisced about the club's history. Barrie, 73, has been involved with the club for 58 years since joining as a teenager. "It's been a major part of my sporting life and something I?ve been fully involved in for 50-odd years," said Barrie, who lives in Sutton-in-Craven, a short walk from the club's ground at Sutton Fields. He said the club was started after a group of young men decided they wanted to form a team back in 1948. With the help of Mr HE Winch, who was headmaster of Glusburn School, the Cross Hills Youth Club was founded. In its inaugural season, in 1949, the club joined the Second Division of the Craven league and played on a field near Sunny Bank Road. The pitch was known as Hill 60 because of a steep incline. 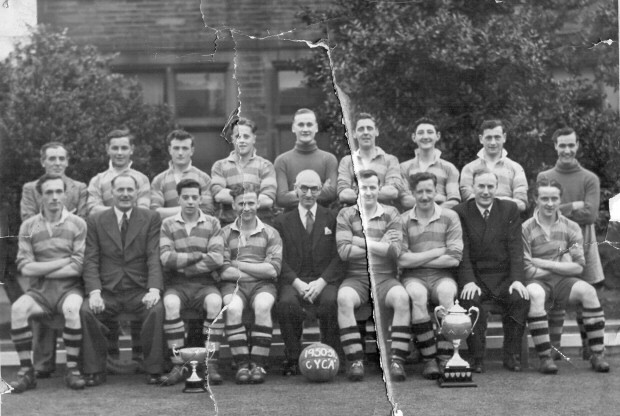 By 1950 the club had an A and B team and, by the end of the season, the A team achieved promotion to the league's Premier Division. From 1951 ? and for the next 48 years ? Cross Hills had a team in the Craven League's top division. In the early years, the club had grounds at Walker Field (now Walker Close), Parks Field (where the club now plays) and a ground at what is now the South Craven School playing field. After a brief stint away from Parks Field because of a farmer using the ground to graze his sheep, the club returned there in 1961. Tuesday, January 9, 2018 11:51 Alec Shuttleworth, who I believe still lives on Sutton Fields, stands behind Dr. Renwick and next to Gordon Waring. Thursday, January 11, 2018 15:51 A FEW MORE NAMES TO HELP SOLVE THE REST OF THE SQUAD. Back row. Coach, David Baxter, Brian Dolphin. Roy Hudson, Peter Waddington, Alec Shuttleworth, Gordon Waring, ?, Bill Moon. Front row. Roy McLeod, ?,Glyn Didsbury, Alec Riddiough, Fred Hudson (Manager)?, ?, Dr. Renwick, Arnold Jones. John Driver Gordon Waring Alec Shuttleworth, Billy Moon. I was hoping that someone would correct the mistaken identification of Peter Barsby. Your memory is still as sharp as ever with the rest of those pictured. Tuesday, October 16, 2018 16:06 This is a coincidence . Yesterday I was in a Skipton cafe looking through the Craven Herald and seeing a pic of a cricket team taken into them by Brian Dolphin of Sutton . I looked at the faces easily recognising Brian and Tony Winstanley who incidentally I had as a boyfriend when I lived in Cowling . Brian Dolphin won't know me I don't think but he was on the same buses as me when I went to Utley GGS . So last night I looked in here and what should come up but the name Brian Dolphin again! I know there are so few my age who will be alive in Cowling now it was heartening to see that Dolly still lives and in Sutton . I used to play in the park there with a couple of Sutton lads ,Jack Sessford and Tony George and another place in Sutton was the home of the lady who supplied fancy dresses,this I needed every yearto enter Cowling Gala . Sutton girls who went to Utley GGS I remember were the Wagstaff ones . Oops , hope no one minds me posting . Tuesday, October 16, 2018 16:22 Hi Patricia, welcome to the forum. Your reminiscences are very welcome!